That sound you hear is a heart of India rubber bouncing down the wooden stairs. At the bottom step a child catches it in darkness. And skips around the corner to continue playing in some hidden world. 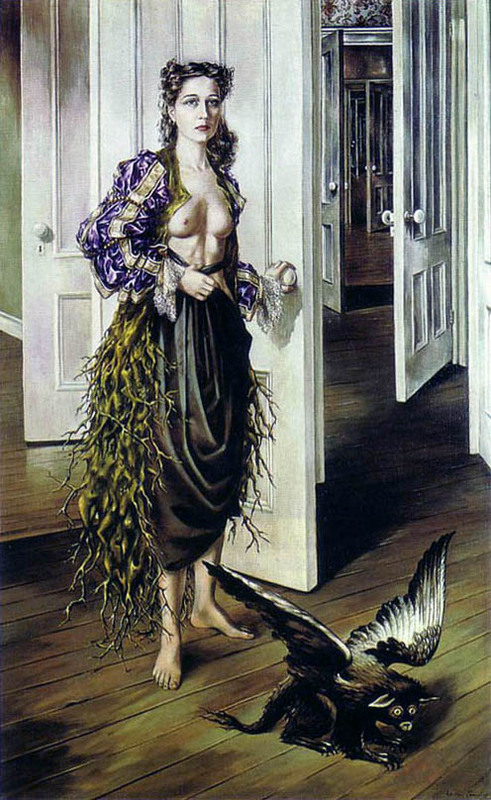 Dorothea Tanning: poet, writer, costume designer, painter, sculptor. The last original Surrealist is gone. Who now will have the bravery to cast their heart into the void? See also: her official site, interview in Salon. Here is another excerpt from her fantastic writing. "Please be advised that I will vaccinate the world with a desire for violent and perpetual astonishment. Disguised in my own presence, I will conduct a horde through the five aqueducts of knowledge after which their guardians will ask the authorities for replacements. I will provoke prodigies. When I have built the torpid town certain words will fall into disuse: eminent prominent peerless noble honorable lordly stately august princely majestic sacred and sublime. I will make rhapsodies from grains of sleep. I'll wrap up a man-making hat and drop it in the mailbox. I'll hold a revolver up to nature. When professional critics lose themselves in the swamp I'll arrange a delegation of chimeras with their own language and their own secrets. As for the night, I will discover all its phases. And I will fall in love."